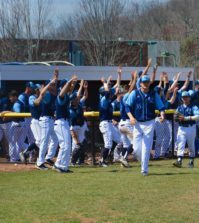 In a battle for first place in the Northeast Conference, the Quinnipiac baseball team fell in its first game of a four-game series between Monmouth,11-5, on Friday at the Quinnipiac Baseball Field.The victory puts Monmouth (14-12, 9-4) ahead of Quinnipiac (12-12, 8-5) in the NEC standings. Despite the loss, Ben Farina went 2-for-4 with a home run. Farina moves into third place in Qunnipiac’s all-time career hit leaders with 212 passing Wilson Matos. He tied Matos in the bottom of the eighth with a single to center field and passed him in the bottom of the ninth with his solo home run. Farina is now behind Ryan Rizzo (238) and Tim Binkoski (245). Freshman Zac Palmer went 1-for-4 with three RBIs. Mickey Amanti went 2-for-5 with an RBI and Chris Migani went 1-for-5 with an RBI. Both continue their average of a hit-per-game against NEC teams. Quinnipiac pitcher, Derek Lamaccia pitched the first five innings and suffered the loss letting up eight runs. Kevin Castodio came in to pitch for Lamaccia and let up the last three runs. The Hawks took the lead in the first inning with a three-run home run from Danny Avella and never lost control of the game. Monmouth extended their lead to 4-0 before the Bobcats scored a run off of Palmer’s ground out to second base in the bottom of the second. 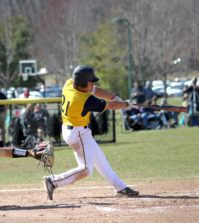 Quinnipiac cut the lead to 4-2 in the bottom of the third when Migani singled through the left side sending Amanti home. But Monmouth’s offense could not be beaten. The Hawks soared in the fifth inning scoring seven runs. Two runs came from an Avella home run, RBI singles from Josh Boyd and Jamie Rosenkranz, and a three run home run from Jake Gronsky. The Bobcat’s offensive effort was too little too late after scoring two runs late in the game. Palmer drove in a run with a single to center field in the eighth while Farina capped the scoring with a solo home run in the ninth. The Bobcats will host Monmouth tomorrow in a doubleheader starting at 12 p.m.